Documentation of participant compliance is often incomplete in studies examining the effectiveness of injury prevention protocols in team sports; the documentation of participant compliance is inconsistent. Whereas a number of studies have neglected compliance altogether,4,–,12 some have noted the importance of compliance, but not reported it.13,–,18 Others have reported compliance, but not linked it to an injury prevention effect estimate.19,–,26 Finally, some studies have linked compliance to an effectiveness estimate.27,–,32 We thus have limited data on the relationship between compliance and effectiveness. Furthermore, when injury prevention measures are embedded into team training sessions, the compliance of the team is likely to depend greatly on the motivation, choices and actions of the head coach. We therefore determined to what degree an intervention is accepted and adopted by coaches. Recording individual participation, on the other hand, reveals the rate of uptake and actual usage of the intervention for each player. Recording team and player compliance together will provide detailed data on the overall compliance with the intervention (figure 1). The distinction between compliance among teams and players, and definitions of compliance used in this study. The primary aim of this study was to characterise the compliance of youth teams and players using an injury prevention training programme and to examine whether high compliance correlated with lower injury risk. We also wanted to identify coaches' attitudes towards injury prevention training and to examine whether their attitudes were associated with the compliance or the risk of injury within their teams. Of the 181 teams organised in the girls' 15 and 16-year divisions in the south, east and middle regional districts of the Norwegian Football Association, 65 out of 125 teams entering the study were randomly assigned to the intervention group and formed the basis for the present paper (figure 2). To be included, teams had to carry out at least two training sessions per week, in addition to matches played. The competitive season lasted from the end of April until mid-October 2007, interrupted by a 7-week summer break. All teams were also followed for 2 months of preseason training (March–April). The recording of compliance included all the teams (n=65) in the intervention group, and the investigation of attitudes and beliefs towards injury prevention included all the coaches (n=65) of the intervention teams. Flow of team clusters and players throughout the study. The coaches reported injuries and individual player participation prospectively, as the number of minutes of exposure, for each training session and match on weekly registration forms throughout the study period. Furthermore, for each session the coaches quantitatively recorded whether the warm-up programme was carried out, as well as the participation of each player in the programme (yes/no). The registration forms were submitted by e-mail, mail, or fax to the Oslo Sports Trauma Research Center. Data on players who dropped out during the study period were included for the entire period of their participation. For comparison with results from previous studies compliance was defined and reported in multiple ways (figure 1). One physical therapist and one medical student were given specific training on the protocols for injury classification and injury definitions (see Soligard et al)33 before the start of the injury recording period. These injury recorders called every injured player to assess detailed aspects of the injury based on a standardised injury questionnaire,34 and the players were in most cases reached within 4 weeks (range 1 day to 5 months) after the injury had occurred. After the season, from mid-October to November, every coach in the intervention group was called to evaluate the complete warm-up programme and the exercises used, as well as to assess attitudes and beliefs towards injury prevention training in general. This retrospective study was based on a questionnaire designed by the authors, consisting of 28 closed and three open questions. The questionnaire was standardised using dichotomous or five-point Likert scale response alternatives in accordance with questionnaire design guidelines to ensure reliability and validity.35 All interviews were conducted by a physical therapist (AN). This report is based on an exploratory post hoc analysis of data from the intervention group in a randomised controlled trial.33 All statistical analyses were conducted using SPSS for Windows version 15.0 and STATA version 10.0. We used a Poisson regression model based on generalised estimating equations taking cluster effects into account as a per protocol analysis to compare the rate ratios (RR) of the risk of injury between teams as well as players (independent of club) stratified into tertiles of compliance according to the number of prevention sessions completed: low, intermediate and high. We used χ2 tests to compare categorical variables between these subgroups and one-way analysis of variance to compare continuous variables. To investigate the relation between the coaches' attitudes and compliance with the warm-up programme, logistic regression analyses were used with compliance as the dependent variable. Attitudes among coaches who represented teams with high compliance were compared with attitudes among coaches from low-compliance teams. The teams who completed both the intervention study and the study of attitudes were included in this analysis. To investigate the relation between the coaches' attitudes and their teams' injury risk, logistic regression analyses were used with injury risk as the dependent variable. The results are presented as OR with 95% CI and p values. The summary measure of injury incidence (i) was calculated according to the formula i=n/e, where n is the number of injuries during the study period and e the sum of exposure time expressed in player hours of match, training or in total. Descriptive data for exposure, compliance with the warm-up programme, injury incidences and attitudes towards injury prevention training are presented as means with standard errors or 95% CI. RR are presented with 95% CI. Two tailed p values of 0.05 or less were regarded as significant. Of the 65 teams in the intervention group, 52 (1055 players) completed the season and thus the compliance study. Fifty-six coaches completed the study of attitudes and beliefs towards injury prevention training; 50 belonged to teams that completed the compliance study, whereas six belonged to teams that dropped out during the season (figure 2). The 52 teams completed the injury prevention programme in 2279 (mean 44±22 sessions, range 11–104) out of 2957 training sessions and matches throughout the season (77%), corresponding to 1.3 times per week. Of all the teams, 60% (n=31) completed the injury prevention programme two times per week or more in accordance with the recommendation. In all tertiles of compliance, the majority of the injury prevention sessions were conducted in the first half of the season (March–June). In this period the programme was completed in 82% of all sessions, whereas 75% of the teams (n=39) completed the prevention programme in 20 or more sessions (table 1). In the second part of the season (August–October) the programme was completed in 58% of all sessions. The difference in compliance between the first and the second part of the season was particularly noticeable in the tertile with low compliance; these teams completed the injury prevention programme seven times more often in the first part of the season. In the second half of the season the teams in the lowest tertile completed the programme in 2.4±4.1 sessions over a period of 11 weeks. The 1055 players completed the injury prevention programme in 28 212 (mean 27±19 sessions, range 0–95) out of 35 589 sessions throughout the season (79%), corresponding to 0.8 sessions per week. However, for each session the average number of players per team that participated in the injury prevention programme was 12.0, corresponding to only 59% of all players on the roster (mean 20.3 per team). As the team compliance was 77%, all the enrolled players therefore completed the injury prevention programme in 47% of the maximum number of sessions the teams possibly could have conducted. 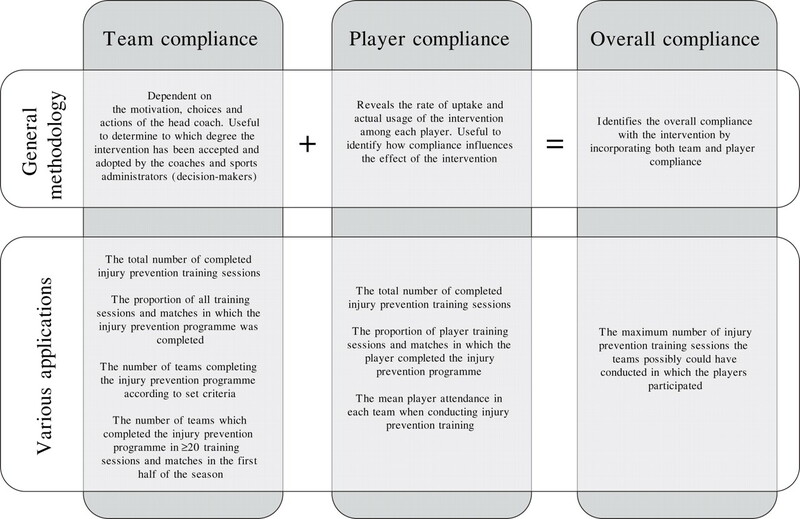 The tertile of players with high compliance completed the injury prevention programme more than six times as often as players in the tertile with lowest compliance (table 1). There was no difference in the risk of injury between teams with high, intermediate and low compliance (table 2). However, the risk of injury was 35% (p=0.011) lower among players in the tertile with the highest compliance (mean 49.2 sessions per season, 1.5 sessions per week; range 33–95 sessions per season) compared with players in the intermediate tertile (mean 23.4 sessions per season, 0.7 sessions per week; range 15–32 sessions per season). In contrast, there was no significant reduction (p=0.13) of injury risk between the intermediate tertile and the tertile with the lowest compliance (mean 7.7 sessions per season, 0.2 sessions per week; range 0–14 sessions). Furthermore, the risk of an acute injury was 39% (p=0.008) lower for players in the tertile with the highest compliance compared with players in the intermediate tertile, whereas a 35% reduction of injury risk compared with the tertile with the lowest compliance was not statistically significant (p=0.09). All the coaches (n=56) expressed that including injury prevention training in the training programme is important; 80% (n=45) stated that it is ‘very important’ and 20% (n=11) that it is ‘important’. Regarding the perceived risk of sustaining an injury, 29% (n=16) of the coaches believed that their players were at high risk, 59% (n=33) believed that the risk of injury was intermediate and 13% (n=7) believed that the risk was low. However, 54% (n=30) of the coaches had never previously conducted injury prevention training. According to 75% (n=42) of the coaches, the media and profiled athletes largely influence their motivation to carry out injury prevention training. The majority of the coaches believed that the motivation of the coach is significant when trying to motivate young female football players to do injury prevention training (95%, n=53). Of the coaches from teams with high compliance, 94% (n=16) believed that the players' motivation to complete the injury prevention programme was high, as opposed to 41% (n=7) of the coaches from low-compliance teams. The probability of having low compliance with the injury prevention programme was 87% higher if the coach believed that the programme was too time-consuming (OR 0.13, 95% CI 0.03 to 0.60, p=0.009). The opinion that this injury prevention programme did not include enough football-specific activities resulted in an 81% higher probability of low compliance with the programme (OR 0.19, 95% CI 0.40 to 0.92, p=0.038). Whether the coach had previously utilised injury prevention training in a similar group of players did not influence the compliance with the injury prevention programme (OR 0.60, 95% CI 0.14 to 2.47, p=0.47). There was no significant relationship between the injury risk of the teams and the overall attitude towards injury prevention training among their coaches (p=0.33). However, compared with teams with coaches who had never undertaken injury prevention training before, teams with coaches who had used such training previously had 46% fewer injuries (OR 0.54, 95% CI 0.33 to 0.87, p=0.011). In this study, compliance was good; teams used the injury prevention programme in 77% of all training sessions and matches and players completed the programme in 79% of the sessions they attended. Also, the risk of overall and acute injuries was reduced by more than a third among players with high compliance compared with players with intermediate compliance. The players with high compliance completed twice as many injury prevention sessions as the players with intermediate compliance (1.5 vs 0.7 sessions per week). Interestingly, the preventive effect of The 11+ therefore increased with the rate of use, at least when conducted more than 1.5 times per week on average. No studies have similarly compared the risk of injury in players and teams with high, intermediate and low compliance with an intervention to prevent injuries. However, similar indications of exposure–response relationships have been found previously.28 Furthermore, a post hoc analysis showed that compared with the controls,33 players with high compliance experienced a 45% reduction in the overall risk of injury (data not shown), that is, an even greater effect than when compared with intervention players with intermediate and low compliance. Overall, the intervention players completed 0.8 injury prevention sessions each week on average, less than the recommendation of at least two sessions per week. However, they still experienced a 30–50% reduction in the risk of various injuries compared with the controls. This indicates that the injury prevention programme achieved the desired injury preventive effect. In contrast to the findings among players, we found no significant differences in the overall or acute risk of injuries between teams with different levels of compliance. This is explained by the large variations in compliance among the players within each team; the players with high compliance had a sixfold higher use of the programme compared with the players with low compliance. These findings emphasise the inadequacy of recording compliance on a team basis only. The overall compliance is a product of the compliance among the teams and the player participation rate (figure 1). Although the compliance among teams and attending players was good, certain players in each team rarely took part in the team activities, despite being registered on the roster at the start of the season. Therefore, the whole group of enrolled players completed the injury prevention programme in 47% of the maximum number of sessions the teams possibly could have conducted. It should be noted that the teams with low compliance reported three times lower exposure to football than the teams with high compliance, and four of 10 teams with low compliance did not report any injuries at all. Even though calculations of injury incidence take exposure into account, a minimum exposure is necessary to be at risk of injury. Moreover, coaches less thorough in conducting the injury prevention programme and recording compliance may also have been less likely to record injuries. If so, the injury incidence in the low compliance group may have been underestimated somewhat. The programme was designed to prevent injuries. However, to make it attractive for coaches and players, The 11+ was specifically tailored to football players and we included elements of variation and progression in the exercise prescription. We also focused on organising streamlined and efficient 3 h educational meetings at baseline, at which the coaches were provided with a selection of material detailing the exercises. Although we gave a set of footballs to the teams that completed the collection of injuries and exposure, no incentives were provided to ensure high compliance by coaches and players other than telephone and e-mail contacts related to data collection. Indeed, the compliance rates among teams in the current study was higher than previously reported among teams,18 21 24 27 28 31 as well as among players.23 29 30 In addition, our intervention period lasted longer than comparable interventions in other studies. Although compliance decreased from the first to the second half of the season, these findings may imply that a long-term intervention period is not synonymous with low motivation and compliance among the participants. Other factors, such as the content, the relevance, the availability and the perceived difficulty of the intervention may also play an important role. Compliance with an intervention depends upon the motivation among the participants to perform a certain safety behaviour and that the barriers associated with the behaviour are limited.2 The strongest motivator for the coach was the expectation of fewer injuries. All coaches emphasised the importance of including injury prevention training in training, and the majority believed that the risk of injury among their players was high or intermediate. Nonetheless, more than half of the coaches had never previously conducted injury prevention training; this suggests that previous barriers associated with such training were too high. Interestingly, injuries were half as likely in the teams of the coaches who previously in their coaching career had undertaken injury prevention training compared with teams of coaches who had not used such training. Previous experience with injury prevention training seems to improve the positive attitudes of coaches and may increase the implementation of The 11+ in both training sessions and before matches. A strength of the study is that the compliance was recorded both among teams and individual players, providing a detailed account of the acceptance of the intervention. In addition, the sample size of both players and coaches was large and the follow-up period was one complete football season. With respect to the coach interviews, the main objective was to identify the attitudes and beliefs towards injury prevention training among the coaches, but we also wanted to evaluate the warm-up programme and its exercises. As a consequence, the interviews were conducted after the season. However, the perceived risk of injury can easily influence the attitudes towards injury prevention training;36 39 thus, it would have been more appropriate to assess attitudes before the season and to evaluate the content of the programme after the season. Regarding the relationship between coach attitudes, compliance and team injury risk, only coaches who completed the recording of compliance and injuries were included in the analyses. Although the most common barrier to study participation reported by coaches was the additional work of data recording and reporting, some teams may have dropped out due to low motivation towards the intervention programme. Therefore, coach attitudes to the programme may be less favourable than those reported by the study participants. Except for a 3 h instructional course with the coaches and team captains in the preseason, the teams received no follow-up visits to refresh coaching skills or give players feedback on their performance. Throughout the season it was up to the coaches to make sure the exercises were performed properly with high quality. Although the programme proved to reduce the risk of several injury types, follow-up visits during the season could have proved helpful in ensuring the quality of the exercise performance and might possibly have resulted in an even higher preventive effect. The coach of each team recorded the injuries, the exposure and the compliance. We did not monitor the validity and reliability of their recordings. In cases in which the registration form was not completed during or immediately after a training session or match the coach had to complete the registration form in a retrospective manner. However, recall bias is presumably small, because the majority of the coaches followed the protocol and submitted their registration forms on a weekly basis. Also, all teams were offered an incentive, provided they recorded all data throughout the study period. It is possible that coaches completed and submitted the registration forms merely to receive the reward, without ensuring the accuracy of the recorded data. This may have impaired the reliability of the submitted data. Knowledge of factors that influence compliance with an intervention is still limited. This study is one of few that have aimed to identify these factors. The findings demonstrated that attitudes towards injury prevention training are associated with the rate of uptake of an intervention. Attitudes are developed from an early age. It may be important to implement injury prevention training as soon as children start participating in organised sports to make it a natural part of their training routines. It is also necessary to increase the understanding of the benefits of injury prevention among coaches in both youth and elite sports. Injury prevention training thus ought to be a core element of coach education and training programmes in football and other sports. When recording and reporting compliance in team sports there should be a distinction between compliance among teams and among individual players. The compliance of a team is highly dependent on the motivation, choices and actions of the head coach. Recording individual participation, on the other hand, reveals the rate of uptake and actual usage of the intervention for each player. The recording of individual compliance is thus necessary to investigate how compliance influences the effect of an intervention and to identify possible exposure–response relationships. Recording team and player compliance together will provide detailed data on the overall compliance with the intervention (figure 1), and such methods should be applied in future research. The compliance among players and teams with The 11+ injury prevention programme was high. The risk of overall and acute injuries was reduced by more than a third among players with high compliance. Positive coach attitudes correlated with high compliance and lower injury risk. ▶ The effectiveness of an injury prevention programme depends, among other things, on uptake of the intervention among participants, that is, compliance. ▶ Knowledge about the relationship between compliance and injury prevention effectiveness is limited. ▶ When embedding injury prevention into team training sessions, recording both team and player compliance is necessary to document overall compliance and exposure–response relationships. ▶ Players with high compliance appear to benefit in terms of fewer injuries. ▶ Positive coach attitudes are associated with high compliance and lower injury risk. The authors would like to thank the project assistants (Birgitte Lauersen, Ellen Blom, Olav Kristianslund and Tone Wigemyr), the coaches and the players who participated in this study.
. A fivefold reduction in the incidence of recurrent ankle sprains in soccer players using the Sport-Stirrup orthosis. Am J Sports Med 1994;22:601–6.
. No effect of a video-based awareness program on the rate of soccer injuries. Am J Sports Med 2005;33:77–84.
. Injury prevention in Sweden: helping soccer players at risk. J Sport Exerc Psychol 2005;27:32–8.
. Teaching landing skills in elite junior Australian football: evaluation of an injury prevention strategy. Br J Sports Med 2006;40:834–8; discussion 838.
. Comparison of three preventive methods to reduce the recurrence of ankle inversion sprains in male soccer players. Am J Sports Med 2007;35:922–6.
. Comparison of two intervention programmes in young female players in European handball – with and without ankle disc. Scand J Med Sci Sports 2003;13:371–5.
. The effect of a proprioceptive balance board training program for the prevention of ankle sprains: a prospective controlled trial. Am J Sports Med 2004;32:1385–93.
. Effectiveness of a home-based balance-training program in reducing sports-related injuries among healthy adolescents: a cluster randomized controlled trial. Can Med Assoc J 2005;172:749–54.
. The effect of a balance training program on the risk of ankle sprains in high school athletes. Am J Sports Med 2006;34:1103–11.
. A prevention strategy to reduce the incidence of injury in high school basketball: a cluster randomized controlled trial. Clin J Sport Med 2007;17:17–24.
. Lower reinjury rate with a coach-controlled rehabilitation program in amateur male soccer: a randomized controlled trial. Am J Sports Med 2007;35:1433–42.
. A pilot randomised controlled trial of eccentric exercise to prevent hamstring injuries in community-level Australian football. J Sci Med Sport 2006;9:103–9.
. 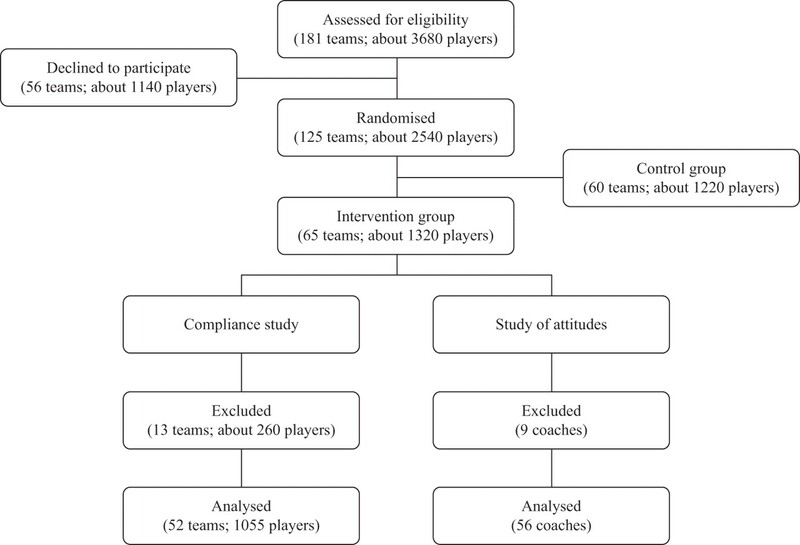 Preventing injuries in female youth football – a cluster-randomized controlled trial. Scand J Med Sci Sports 2008;18:605–14.
. Injury pattern in youth team handball: a comparison of two prospective registration methods. Scand J Med Sci Sports 2006;16:426–32.
. Scale development: theory and applications. California, USA: Sage Publications, 2003:1–176.
. Understanding attitudes and predicting social behavior. Englewood Cliffs, New Jersey, USA: Prentice-Hall, 1980:1–278.
. Self-efficacy. The exercise of control. New York, USA: WH Freeman 1997:1–604.
. Augmenting the theory of planned behaviour with the prototype/willingness model: predictive validity of actor versus abstainer prototypes for adolescents' health-protective and health-risk intentions. Br J Health Psychol 2006;11:483–500.
. From intention to actions: a theory of planned behavior. In: Kuhl J, Beckmann J, eds. Action-control: from cognition to behavior. Berlin: Springer, 1985:11–39.